Bio: Bennett’s journey to MMA began in high school when her water polo coach convinced her to try wrestling. From that point, she was hooked. The Utah fighter turned pro in 2012. 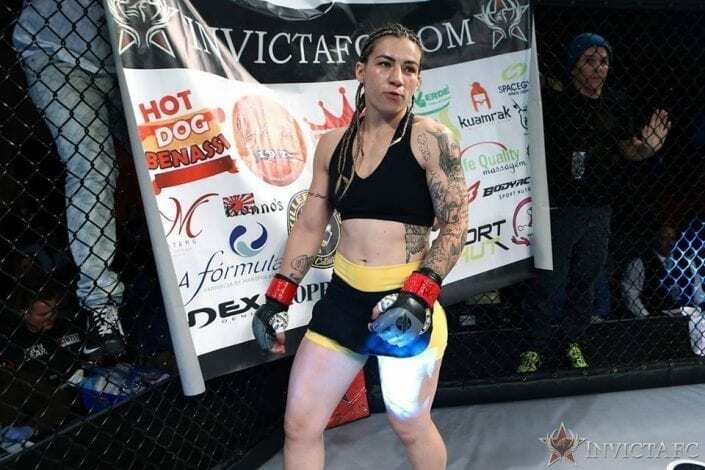 She reeled off four wins competing in her home state, including victories over Ultimate Fighter winner Julianna Pena and fellow Invicta fighter Colleen Schneider. Bennett joined Invicta in 2014 and emphatically introduced herself to the flyweight ranks with a second-round TKO over veteran Michelle Ould. She edged out Brazilian Jennifer Maia at Invicta FC 10 before announcing her intentions to drop weight classes. Bennett made her strawweight debut at Invicta FC 11, topping Norma Rueda Center on the scorecards. My schedule is quite hectic. I wake up in the morning groggy and slightly confused, yet I throw on my workout clothes and running shoes and head out the door. I finally wake up about 15 minutes into my run. When I get home I hurry and get ready and I shuffle off to work. I’m there for a little under two hours before down a bit of caffeine and head off to team practice. Depending on the day its either sparring, wrestling, jiu jitsu (or a little bit of everything); either way my coaches Jason Mertlich and Rad Martinez have some fun, albeit challenging, practice in store. After our 2 hour team practice I head back to work for 6 more hours of selling home security and automation systems. Once I clock out of work I rush home to get changed once again and head back to the gym for some more jiu jitsu and pad work. After a couple more hours of that I head home to shower, eat, then pass out on my couch for a bit before I finally drag myself to my bed to sleep the rest of the night and get back up and do it all again. (Some days I mix in strength and conditioning, with Coach Austin Carter, in the morning instead of running, but the days always begin groggy and slightly confused). So my story into martial arts begins back in high school. I was on the water polo team and one of the assistant coaches was also the assistant wrestling coach. He actually told me to give wrestling a try and I was immediately hooked. I loved it. Then I found my way out to Utah and I needed a 1 credit exercise class at the college I was going to. And man, that was a great choice, because I loved it. And because I am kind of a fat kid, and I really enjoyed kickboxing, I joined the local LA Boxing at the time to stay in shape. Then that gym closed and the gym I’m at now opened next door and I moved over there and eventually started jiu jitsu and put everything together. And man, I’ve made some terrible decisions in my life, but the steps that led me to MMA were the best I’ve ever taken. Honestly, I would love to be an archaeologist. I’d be lying if this didn’t stem from my deep seeded love of Harrison Ford (Indiana Jones), but I did take several archaeology classes in college and they were awesome. Whether it is doing research, going on digs, teaching it, or just working in a museum, I love it all. I’ve even been considering going back to school for it honestly. WHAT PROFESSION WOULD YOU NEVER LIKE TO ATTEMPT? I’d like to fight Teddy Roosevelt. He was a boxer during his time and an all-around badass (he was shot in the chest and still gave his 90 min planned speech before going to the hospital). I’d love to meet him, and seriously, how often do you get a politician that’s that much of a rugged man’s man these days? The answer is: hardly ever) at least in the US that is. .